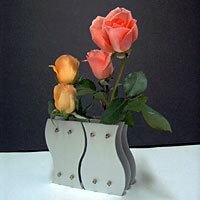 Modern Bud Vase Pair: 2 graceful flower vases designed to fit together! These 2 interlocking bud vases make a perfect statement for any couple. Both are 4-1/2" high and crafted from aluminum. These identical vases can be used either side up. Each bud vase includes 2 removable glass vials for flowers. Just slip them in once you've placed the vase.